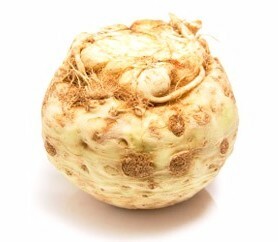 Celeriac (sah-lair-e-ack) or celery root has a celery-meets-parsley flavor. This remarkably ugly root vegetable can be used in a ton of ways and hold up to all kinds of preparation: Flavorful and not mushy in soup, crisp and vibrant sliced fresh, whipped and dolloped on top of a filet of fish, it goes on. How to prepare: We know this root veggie isn’t exactly…inviting, but trust us, celeriac is well worth the dirt! While we’re normally more on team scrub than team peel, this is definitely a peel scenario. In fact, it may be easiest to use a knife and slice off the tough outer layer. You’ll be struck by the green flesh and a whiff of that fresh celery scent. We like to slice and add to soups, mash or whip for a new side dish, chop into matchsticks to throw on salad, and even use a mandoline to make chips! Believe it or not, the most common way to prepare celeriac is in a remoulade. In a large bowl, mix 7 tbs mayonnaise, 2 tbs mustard, and the juice of one lemon together thoroughly with a generous sprinkling of salt and some freshly ground black pepper, so it all becomes one sauce. Peel and quarter the celeriac then, working quickly, coarsely grate it and stir into the sauce until evenly coated. This remoulade is perfect to serve on crab cakes or fish, with fried or baked chicken – heck, the Brits eat it on toast!